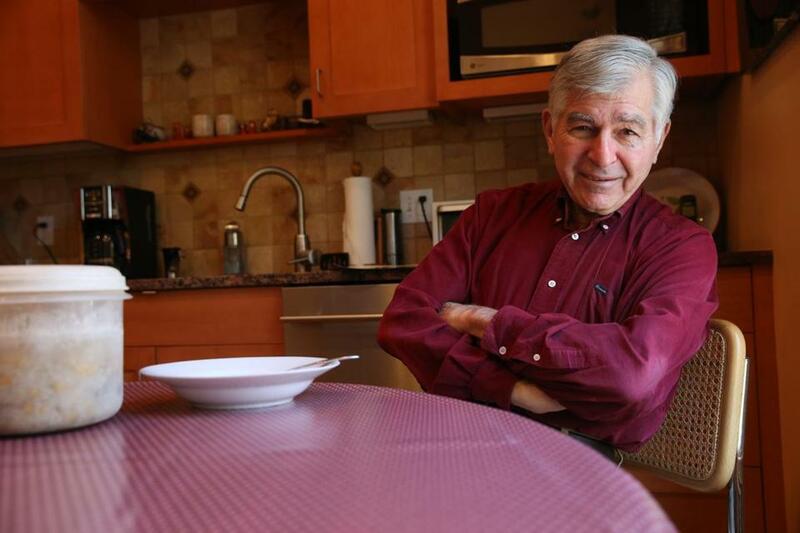 Former governor Michael Dukakis, in the kitchen of his home in Brookline. This story was first published on Nov. 25, 2015. You’ve carefully stuffed, cooked, and carved the turkey. You’ve sliced up all the extra pieces, packing them in tinfoil for leftovers. And you may think you’ve used every possible aspect of that turkey. You’d be wrong. Michael Dukakis would very much like your turkey carcass. The man is renowned for his thriftiness — he drinks coffee bought in bulk at Costco, at 3 cents per cup — and he preserves every last element of the Thanksgiving dinner. Right down to the bone. He preserves the carcasses, stuffing seven or eight of them in his freezer after each Thanksgiving, which on its own is quite a feat, requiring sharp scissors to get the bones down to a more reasonable size. Throughout the course of the year, once every month or two, he removes one of the carcasses. He gets out a pot. He pours enough water to cover the bones, adds an onion, and lets it simmer for at least three hours. He cleans the meat off the bones, he adds in rice and any assortment of vegetables (“Peas are good. Carrots are good”). He heats it up, and relishes the smell that permeates the house on Perry Street. Listening to an 82-year-old man who has been eating this concoction since his mother made it for him as a boy, it’s hard to imagine anything tastier. It’s all part of Dukakis’s aversion to waste — be it fat in the state budget, litter on the street, or turkey bones in the trash after Thanksgiving. In some ways, this turkey tradition started in childhood. But really, it’s a tradition that he began within his own household two decades ago. “It all started when my dear wife after 23 years of marriage — and she was a good cook, I must say — one day said, ‘That’s it, I’m not cooking any longer,’ ” he said. “Just like that. At the time the only thing I knew how to make was French toast. So I was confronted with a choice: Starve or start cooking. So I’ve been doing all the cooking the last 29 years. First, he says, they eat the chicken itself. Then, just as he does with the turkey carcass, he uses the chicken carcass to make soup. The soups, particularly hearty ones, have become a bit of a specialty of his. He says he also makes anadama bread using a 20-year-old bread maker (with a basic bread recipe, but adding cornmeal and molasses) and Greek salad using vegetables grown in his backyard garden. When Dukakis travels for Thanksgiving, the carcass that’s left travels back home with him. Often, it’s packed in the car, but one year when they took the train, the carcass did, too. He also insisted on carrying the carcass with his luggage back home to Brookline. It took him nearly a year to finish off the last of the turkey carcasses from Thanksgiving 2014, clearing the freezer of the space needed for this year over the weekend.